Patons SC19: Great vintage toddlers outdoor set knitting pattern in fair isle from 1960s. This baby fair isle design has a zip jacket to fit 20-22 inch chest and trew with fair isle trim, mittens with thumb and a pull on hat all trimmed with fair isle. Knitted in double knitting wool, but still work a tension square. Small chart to help with design. Option for bonnet as well as pom pom hat. Patons SC451: Great vintage baby out door set knitting pattern with fair isle style trim from 1950s. This lovely retro set has a long pixie hood, pretty coat and trousers. Knitted in double knitting or 4ply depending on size required. To fit 18 - 24 months or 20-22 inch chest. The design is created by threading a contrast yarn through the stitches, similar to Swiss Darning, very easy to do and gives good imitation of fair isle. Robin 328: Fabulous vintage knitting pattern for boys brace trouser set 1940s. This is a lovely pattern with super, colourful fair isle on the braces and waist band of the little short trousers, Small chart. To fit 2-3 years or 24 inch chest in vintage 3ply, so try modern 4ply in a tension square for this size or use modern 3ply for smaller size. Robin 804: Great vintage 1958 baby knitting pattern outdoor set. This pattern is lovely, it has instructions for bonnet and hood, mittens, jacket and trousers. Shown here in blue but can be knitted in any colour of your choice. Worked in quick knitting which was in between double knitting and 4ply. So work a tension square in the yarn of your choice and change needles to get the correct tension. Little bands of fair isle are very retro and easy to work or may be just knitted as plain bands of contrast colour. 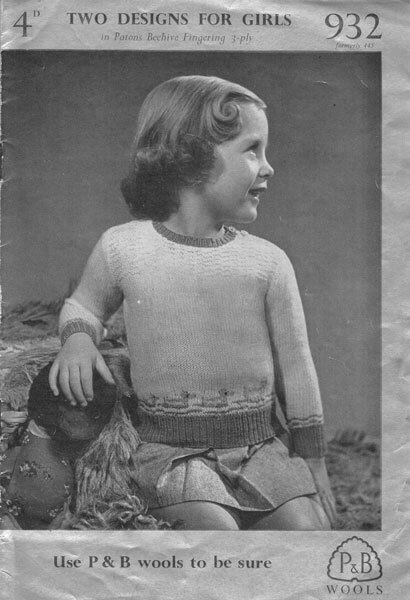 Robin 1533: Lovely vintage knitting pattern for a jumper for 1 year old. To fit 20"-22" chest. Knitted in baby quickerknit which was similar to baby double knitting, work tension square to see if you need to change needles to get the correct fit. Sirdar 94: Great little pattern with rabbits dancing round, flowers for a flower child or trendy Fair Isle, knitted in vintage 3ply, try tension square to see if 4ply might work better - to fit 22" the Rabbits, 23" the Fair Isle border and 24" for the flower border. Sirdar 244: Great vintage knitting pattern for babies cardigans with motifs. This lovely pattern has little Scottie dogs on one and a car with a caravan and pick up truck and traffic lights for a boy or you can knit it plain or just one of the motifs. Worked in double knitting, Always work a tension square and change needles if needed. I knitted this one for my daughter in 1970. To fit 2-3 years 22 -23 inch chest. Viyella 2001: Great vintage baby boys fair isle picture knit suit 1940s. This lovely pattern has instructions for a little jumper with wooden horse and golly on the yoke - to fit 18-24 months or 23 inch chest. Button on shoulder, lovely period pattern. Always work tension square and change needles if needed , worked in vintage 3ply so try modern 4ply in a tension square. Viyella 2016: Great vintage baby boys set and girls fair isle cardigan 1940s. This lovely pattern has instructions for a little jumper and pants in simple rib for boy and short sleeved cardigan for little girl with fair isle borders, to fit 18-24 months or 23 inch chest. Lovely period pattern. Always work tension square and change needles if needed , worked in vintage 3ply so try modern 4ply in a tension square. 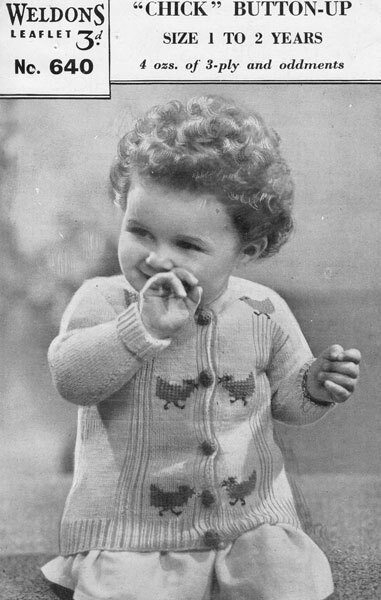 Weldons 798: Great vintage knitting pattern for toddler or baby fair isle jumper 1940s. This little pattern has Humpty Dumpty and soldiers on the front and will fit 1-2 years or 21-22 inch chest. Knitted in vintage 3ply, so try modern 4ply in a tension square and change needles if needed. Chart provided. With button shoulder, fabulous period pattern. Weldon 723: Great vintage babies cardigan with fair isle borders 1940s. This little cardigan is in 3 sizes as shown with nice simple fair isle border, good introduction to fair isle work. Knitted in vintage 3ply, so try modern 4ply in a tension square and change needles if needed. Suitable for boy or girls. Original colours suggested were natural ground, with small quantities of blue, green and rust red. To fit 22, 23, and 24 inch chest. Weldons A856: Great vintage baby toddler knitting pattern fair isle picture knit 1940s. This pattern from the late 1940s is so pretty with little lambs at the yoke and pattern at rib. To fit 1-2 and 2-4 years old or 22 and 23.5 inch chest. Larger size worked by changing needle size. Always work a tension square. Knitted in vintage 3ply, so try modern 4ply to get the correct size. Weldons 873: Great vintage baby set fair cardigan and brace trousers 1940s. This is a super pattern with instructions for this delightful little cardigan and pants or bib-knickers set. To fit 1-3 years, 22 inches chest. Can be worn as sun suit or over little shirt or blouse, suitable for boy or girl. Worked in vintage 3ply so try modern 4ply in a tension square and change needles if needed. Colours for period suggested blue for the ground colour with red and green oddments, but you can use any colour you fancy. Weldons A875: Great vintage child's fair isle knitting pattern 1940s. Instructions for babies fair isle cardigan in 3 sizes to fit 1-2 years, 2-4 years and 4-6 years or 22.5, 24, and 25.5 inches chest. Nice easy fair isle as only one row has two colours in it, nice starter pattern for fair isle project. Worked in vintage 3ply so try modern 4ply in a tension square and change needles if needed. If you would like to try one for a small baby try modern 3ply and is should fit a 6moths baby. Weldons 900FC: Great vintage babies fair isle cardigan jumper knitting pattern 1940s. This is a fabulous little vintage knitting pattern with designs for 12-14 months. Chest 22-23 inches. One set has bows the other has roses worked in vintage 3ply, so try modern 4ply in a tension square and change needles if needed. Weldons B1559: Fabulous vintage fair isle knitting pattern for baby set 1950s. This pattern has instructions for the plain trousers and lovely jumper in all over fair isle pattern. The footless leggings or trews are in plain contrast colour and are 28 inches round at the widest part and 19 inches in length, these measurements are adjustable. The jumper is to fit 22-24 inch chest. Worked in vintage quickerknit, which you cannot get now, but was between double knitting or 4ply, try 4ply in a tension square and change needles or if you prefer to work in double knitting try this in a tension square, but the needle size suggested it might be nearer the 4ply thickness.